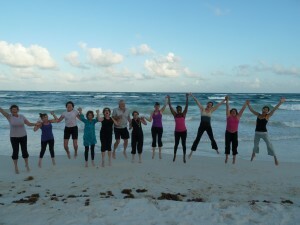 It’s been an amazing week we had in Tulum, Mexico for our Inner Balance – Pilates & Yoga Retreat. This time, I thought I’d keep a little diary, so those of you who couldn’t come can get a glimpse of what a retreat week looks like. As always, feel free to comment of drop me a line. 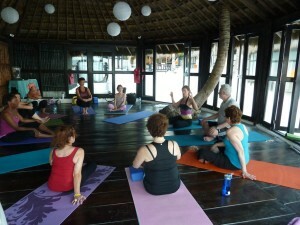 The next retreat is not far off and will be in Koh Samui, from June 23rd – 30th 2012. 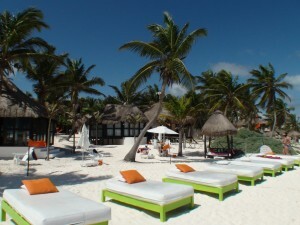 We arrived last night in Tulum. After a cold winter back home in Istanbul with lots of snow, the prospect of coming here was a real sunray. Waking up this morning to the sound of the waves and a salty breezy whafting through the white curtains of our cabana was exactly what I had been looking forward to. While Mary, my retreat partner and yoga instructor is doing her morning meditation, I go for a stroll on the beach, jumping in and out of the turquoise waves and let the sun shine in my face. Throughout the day our retreat participants will arrive and I am so excited to finally be able to put some faces to the names I have been emailing with over the last few months. Some people signed up months ago, so that left time to get to know each other a bit through electronic media, email, Facebook, etc. We also have two last-minute sign ups this time, which makes our group of 12 complete. But for now, I’ll leave WiFi, iPads and my phone (which has no reception anyways) behind and will grab Mary to join me for a yummy breakfast. The early afternoon leaves us with some time to practice in our beautiful beachside yoga studio, which will be our retreat haven for the week. Once again I feel how much my own practice is influenced by the environment. The sound of the waves just a few meters away and Mary’s concentrated asanas inspire me to explore an organic flow in my Pilates movements. It’s our second proper retreat day and things are starting to happen. As we are all getting to know each other our energies melt and feed off each other. I just bumped into Janet as she was walking out from the little massage hut in the center of our miniature village. She was glowing, grinning from one ear to the other. “I just had the best massage in my life” she exclaims and floats right past me. 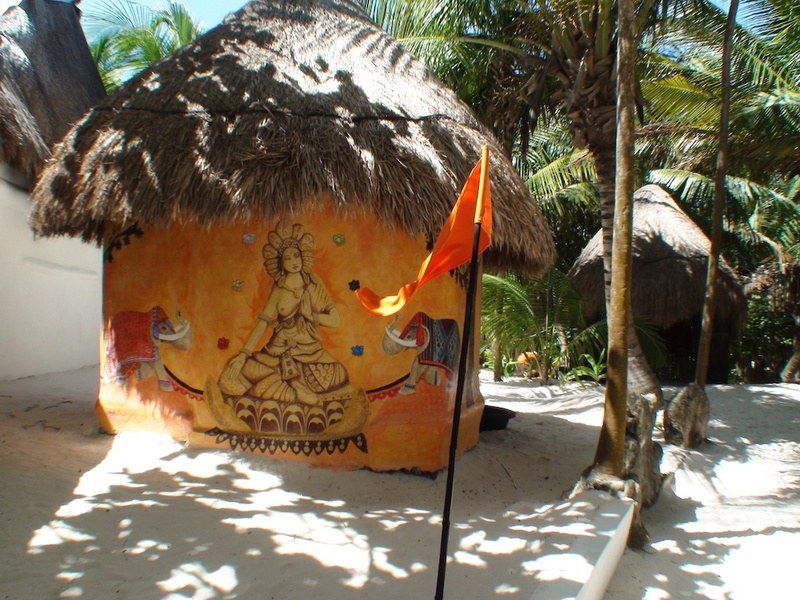 Marco the Italian massage therapist is specializing in Ayurvedic treatments. Making sure not to miss out on the bliss myself I have scheduled my own massage for Friday, just before teaching a Flow class. Massage before teaching is risky, but after what I have heard I am sure I’ll be able to let the energies ‘flow’ right into my class. Marco’s massage cabana. Magic hands. Hours of bliss. 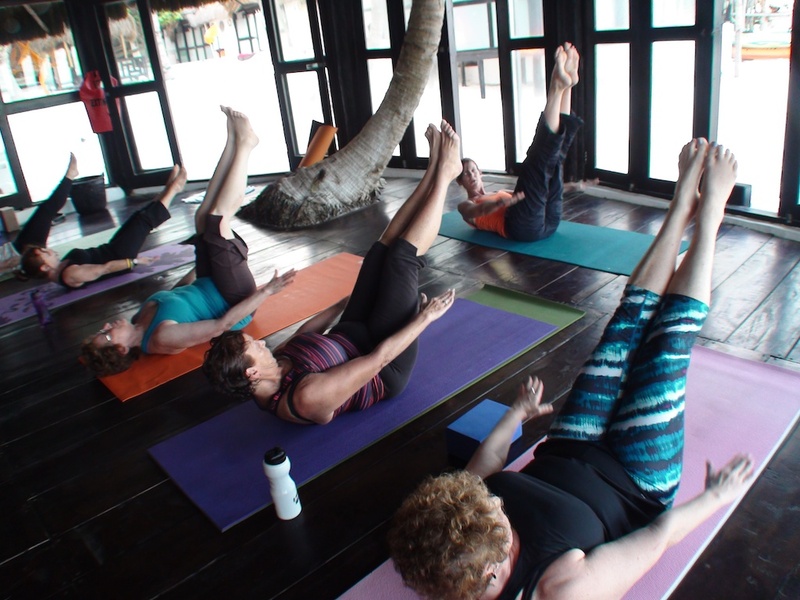 Besides our daily Pilates and Yoga classes, we have a 3-hr Pilates workshop scheduled for today. I use the time to help our group, especially those new to Pilates, to get a better understanding of our core, how to access the deep abdominal muscles and how the pelvic floor and breathing factor into all this. 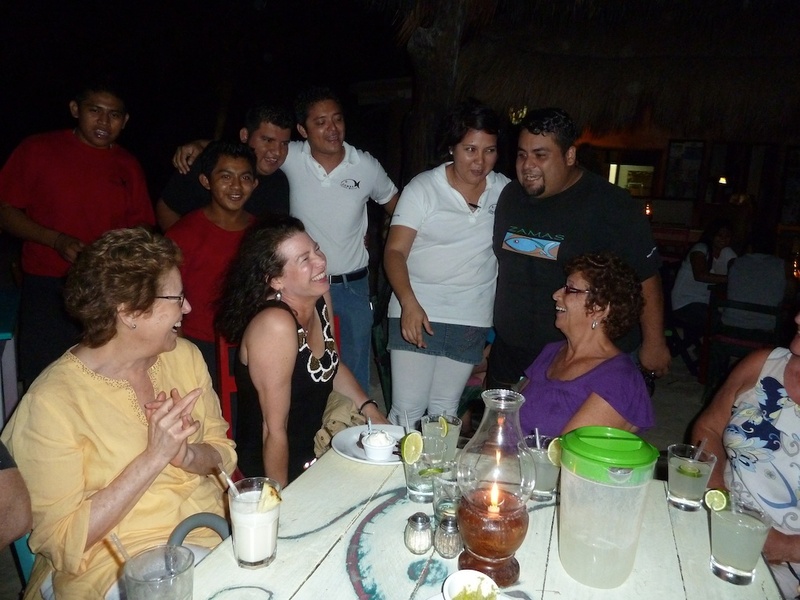 These workshops are usually filled with laughter and new discoveries and I love teaching it. Putting the newly learned into practice we round up the workshop with an intense Pilates class. What an eventful day! Some of us left the Shambala in the morning for a day of exploration and discoveries. I usually schedule at least one excursion day into the Programme and mid-retreat is a good time. After all, we are in a foreign country and all that Yoga, Pilates, great food and sunbathing aside I find it important to encourage my retreat guests to get to know country and culture a bit. 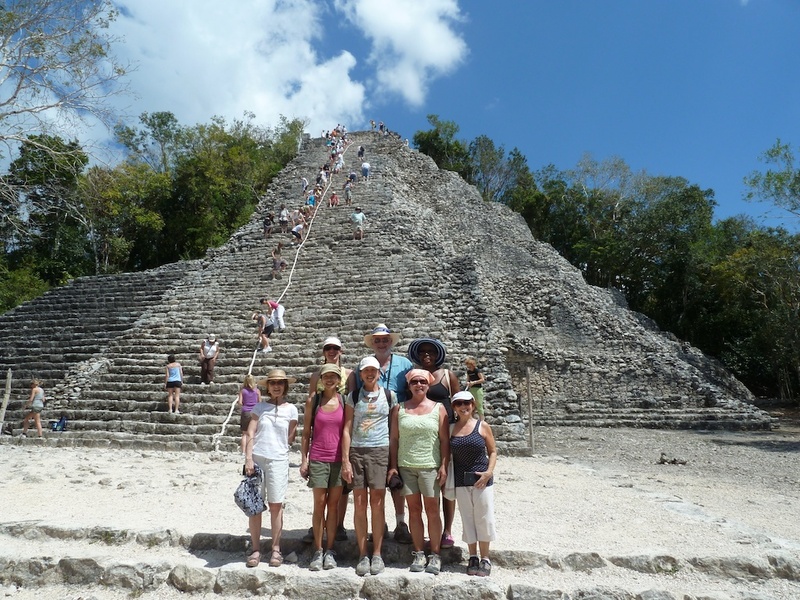 Our first stop are the Maya ruins of Coba – one of the last Maya temples that is still accessible for visitors and so we duly climb the 123 crumbling steps to the top. The view across the treetops is magnificent. 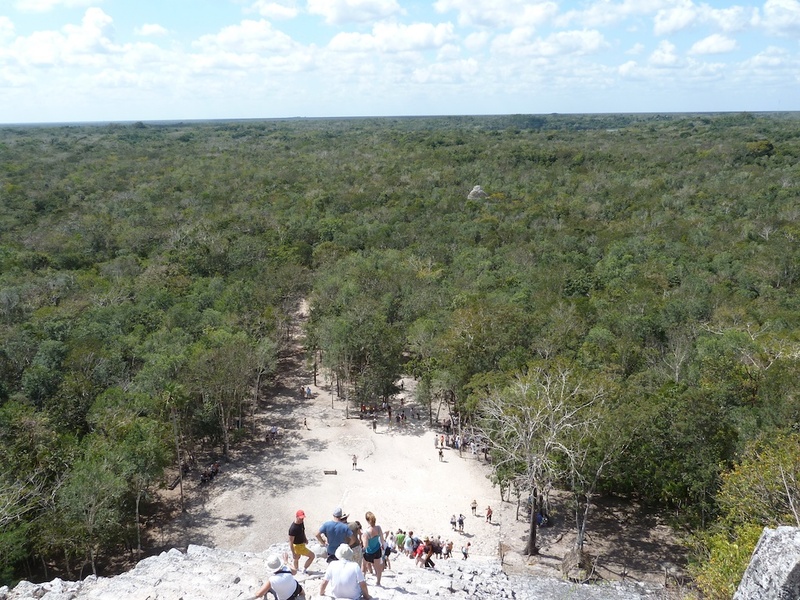 Octavio, our guide, explains how the Mayan kings used to sacrifice their blood to the gods from up there. 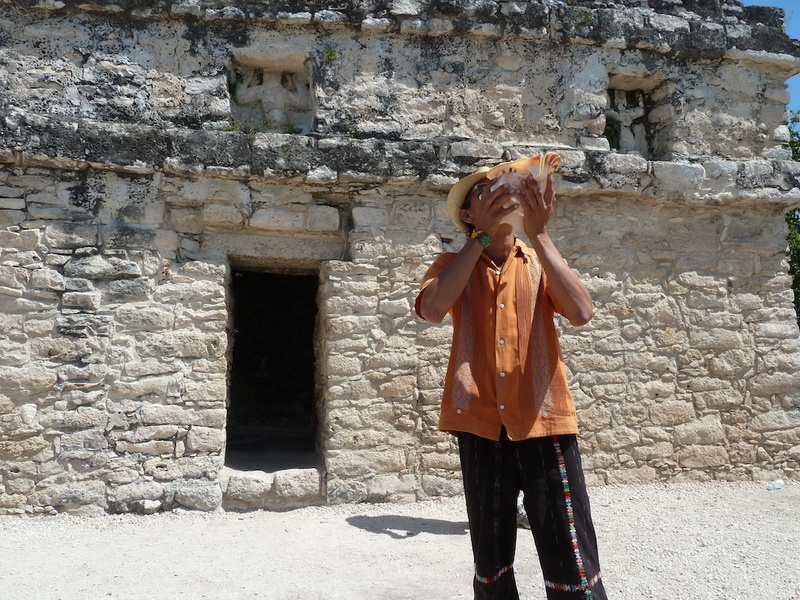 He also brought a conch and a few other traditional instruments which we all get to try, letting the wind carry our (more or less successful) melodies into the blue sky. After lunch Octavio brings us to swim in one of the famous cenotes, circular natural water pools that can be found all over Mexico. This one is a ‘closed cenote’, a crystal clear, turquoise pool inside a large underground cave. The setting is magical. A wooden spiral staircase leads us down to the water edge, passing on the way several jumping platforms (at 10m and 5m) for the brave. We swim and drift around in the water, stalagmites pointing down at us from the vaulted ceiling, the walls are smooth from the lapping water and decorated with gaudi-esque rock flutes. We find an underwater rope which spans from one end of the cave to the other and practice underwater slack lining. I could have spent the whole day at the cenote, but we have Mayan football on the Programme, so we have to leave. 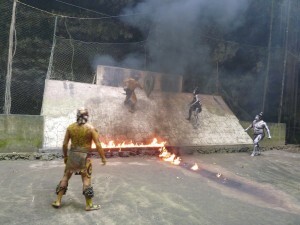 Octavio has organized a small troupe of artists from a Mayan village to perform the ritual show of an ancient Mayan soccer game. On a slanted platform two teams (team Jaguar, representing the sun and team Death, representing the underworld) play against each other. The goal is to drive a heavy ball made of natural rubber through a stone arch on the top of the incline. The rules are simple: hit the ball with any body part except hands or feet. 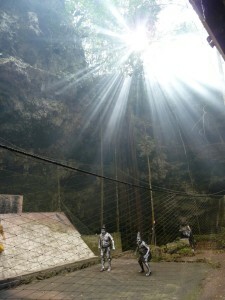 The game is enrobed in rituals, the players painted from head to toe in yellow with black spots as the jaguar and black with white skeleton bones as death. A little boy, no older than 9 maybe, sets the rhythm with a multitude of different drums, flutes and clay pipes. 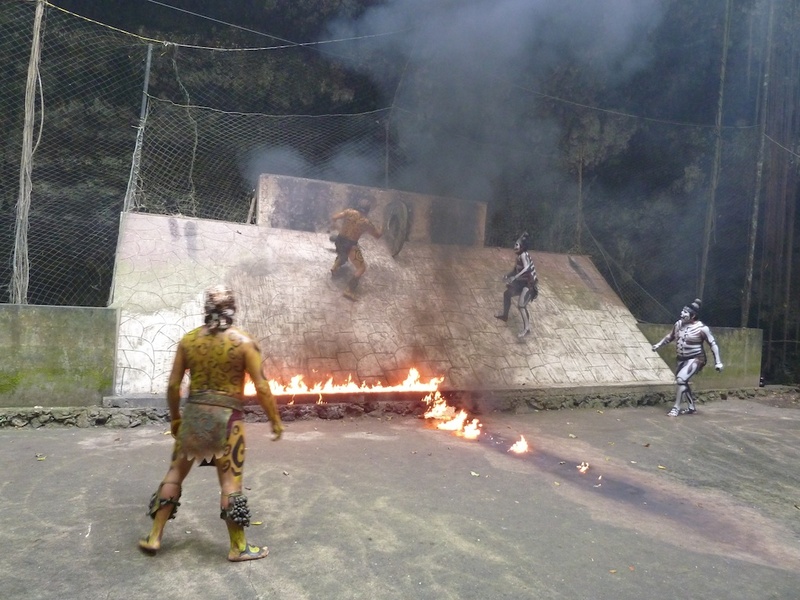 The whole performance climaxes when team death starts to spit fire while the jaguars are dancing over and through a line of fire demarcating the two sides of the field. After about 45 minutes the Jaguars win 3:1 and we cheer in excitement. Of course we know that today this ancient game is only performed for tourists, but we felt it was genuine and the setting inside a large open cenote was stunning. There were no other tourists either – the group had been hired especially for us. The performers wave us good bye as they take off in their little white pick-up truck. In Mayan soccer you are not allowed to touch the ball with hands or feet. Before we return to Shambala we have one more stop. Augustine, a disarmingly good looking and charming Argentinian, welcomes us to his little workshop. He is leading a school for clay work, helping the local Mayans to revive their ancient clay working techniques, hoping to creating a sustainable alternative to coal production and soil damaging agriculture. We all get to try our hands on the clay, spending an hour or so in an almost meditative state, each working on our own little masterpiece. After being so used to computers, keypads and monitors I rediscover how therapeutic it can be to create something with your own hands. When we come home, we are beat. It has been a long and exciting day. We had put an (optional) evening Pilates in the programme and in order not to disappoint the few that didn’t join on the excursion I soon find myself on my mat in the studio. I am pleasantly surprised as each of our 10 participants show up for class. We take it mellow, working on fascia release and alignment. I simply do what I feel my body needs right now, this evening and since we’ve all done the same things, the groups needs are the same than mine. The session becomes a perfect ending to a wonderful day. Today, everybody is happy to spend the day at the retreat concentrating on our practice. Mary’s vinyasa morning class is picking up on speed and flow and ends with some arm balancing and headstand poses. 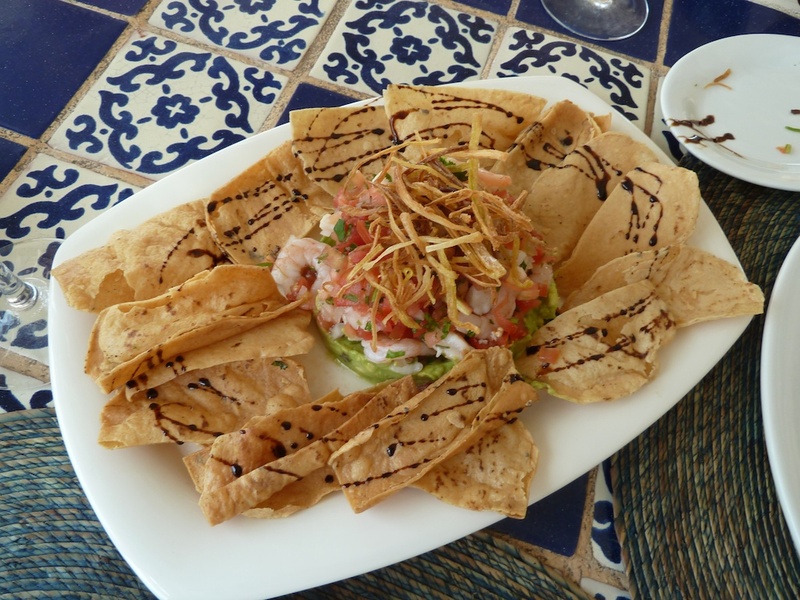 A set of private sessions is followed by a delicious lunch. Today’s guacamole is prepared with a local recipe and spicy, perfect for Mary and myself. For appetizers we have a wonderfully fresh cevice and the main course of seabass wrapped in bananaleaf leaves us pleasantly full. In the afternoon, while everybody lounges on the beach, I go for a long walk. 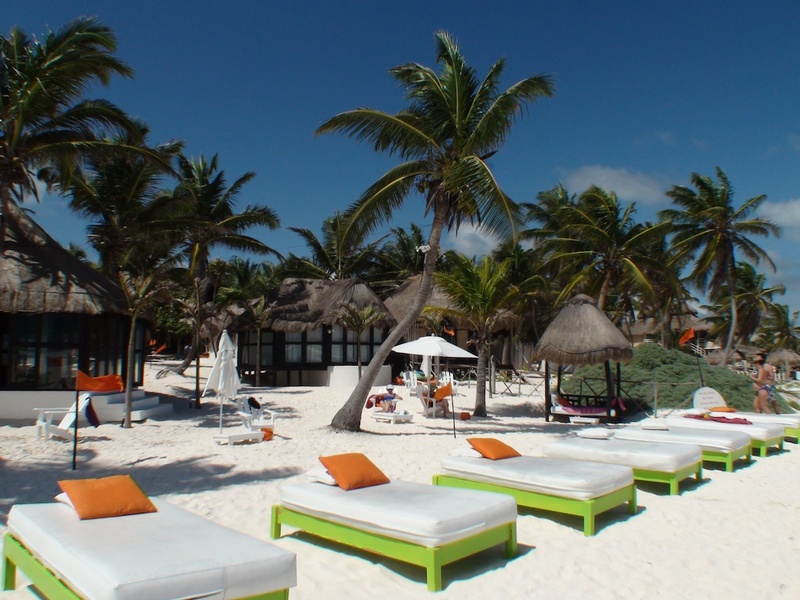 White sand, turquoise water, windswept palm trees – the scenery is picture perfect. In the evening Pilates class we focus on precision and it makes me super happy to see and feel my students’ attention and deep concentration. Later, after dinner, Mary’s open sittings (an invitation the use the candlelit studio for some Meditation time) are starting to become popular – she started on the first evening with three people. Tonight, there are already 6 of us. Early wake up. At 6.30 am we are packed and ready for our second excursion, a kayaking and bird-watching trip to the Sian Ka’an biosphere reserve. 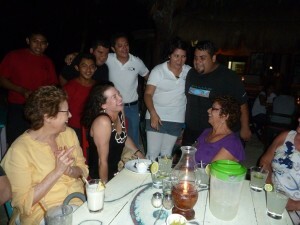 Octavio, who knows more about the Mayan calendar than birds, introduces us to Miguel and Antonio our wildlife guides. Both are extremely knowledgable and speak perfect English. They are also extremely good looking – which becomes a much discussed and giggled about topic later on the way home… Not having had time to eat anything in the morning, Antonio earns extra bonus points with his wonderful homemade Mexican tortilla breakfast feast which he had prepared for us. Feeling thus energized, we are ready for some exercise. For the next hours we paddle our stable sea kayaks along the mangroves, observing roseola spoonbills, herons, ibis, nesting ospreys, the magnificent fregatte bird and many more whose names I don’t recall. We even see a stingray in the shallow water. When we finally return to the pier where we had left, we can’t believe we’ve been on the water for over four hours! 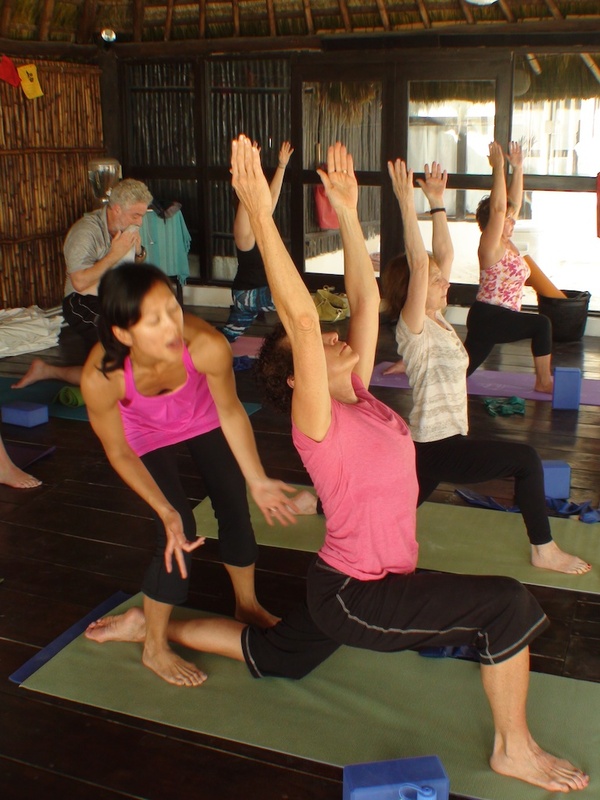 We return to Shambala for a late lunch and despite the long and very physical day we all gather in the early evening for a wonderful restorative yoga class from Mary. 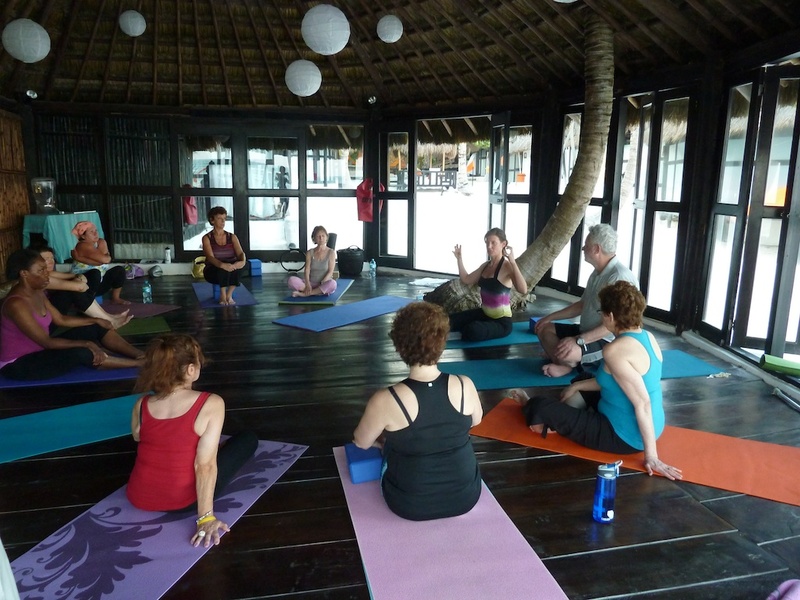 After all the excitement of the excursions it feels great to pick up on the routine of Yoga, Pilates, 3 delicious meals and plenty of beach time. Every day Mary and I have set some time apart to work individually with our guests. These personal one-on-one sessions help us as teachers to get to know each body and personality a bit better. We work on specific issues, such as physical restrictions, a deeper understanding of the practise or how to modify certain exercises for later in the group sessions. We also talk and laugh and answer questions. Of course everybody loves a bit of personal attention and I feel very strongly about making time for everybody during the course of the week. 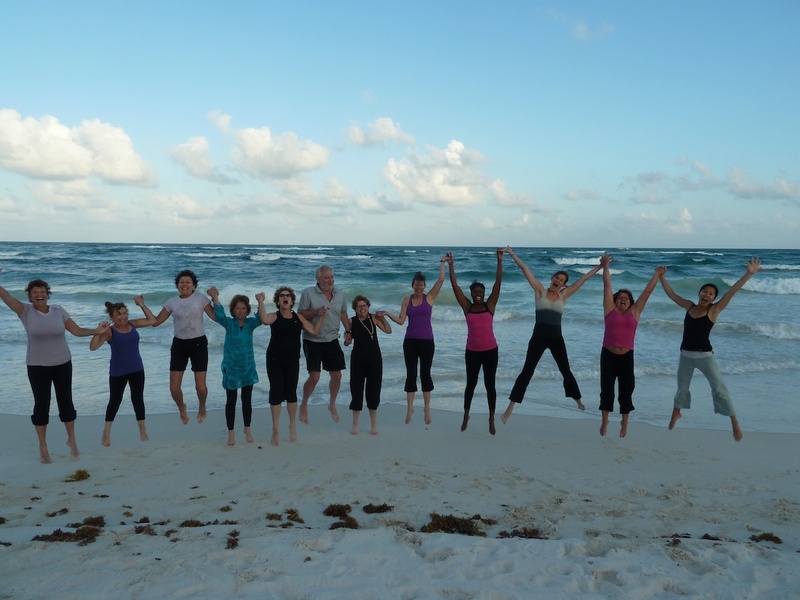 Our reward are the happy faces, the deeper abdominal scoops, the greater focus during the group classes. As one of our participants told me after the evening Pilates session: “After my private today I felt as if you had tailored the group class just for me. It felt like ‘I know theses exercises, I understand exactly what she is talking about’.” Before the retreat she had been completely new to Pilates. have a Margarita? Happy birthday Heidi! Oh, and I also finally had my massage today after having listened to the ravings about Marco’s magical hands for days now. Some even fitted in 2 sessions and supposedly the Italian earned his 10 out of 10 unanimously. 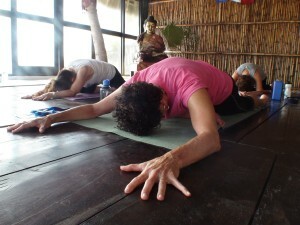 All I can say is that I blissfully floated through my 5pm flow class and that I felt very creative with my transitions. After dinner we all decided to celebrate our last evening ‘outside’ of the resort and went to town for drinks and some live music. Several margaritas, piña coladas and daiquiris later we all fell into our beds, already planning our reunion with a retreat in Turkey in 2013. This morning we said good bye to our studio with a last class lead by both of us. Practicing in a studio which is only a few meters from the sea to the sound of the waves and the breeze of the salty air has been a real treat. When do you ever get to stand still in vriksasana sharing the floor with two palm trees growing right through the roof of the studio? Over these days, Mary and my teaching, her vinyasa flow, my detail oriented Pilates, have really become entwined and connected in so many ways. I love the constant discoveries that we experience when we open ourselves to learning something new. I also find confirmation in what I do through exploring different forms of movement. 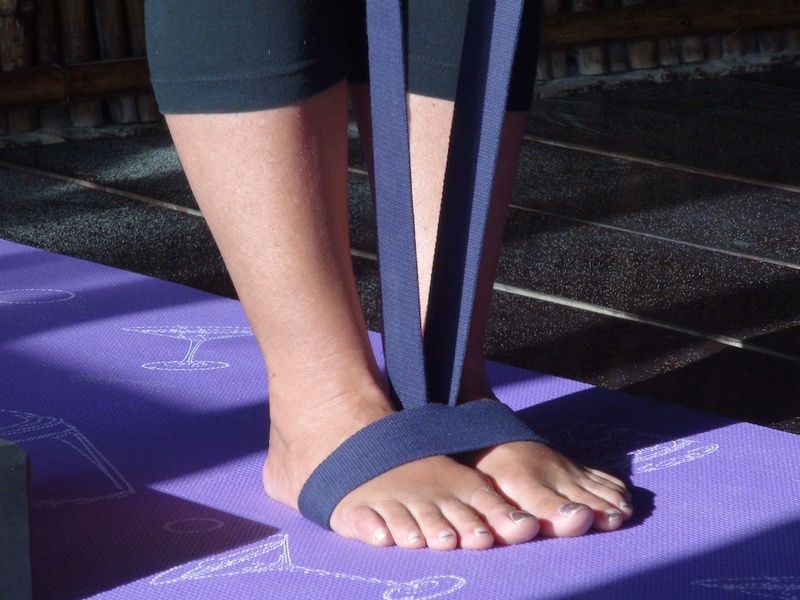 Yoga and Pilates are often a mirror of each other, expressed though different channels. Synergy can only be created if one does not get stuck op on differences, but rather by a search for a common thread and by embracing difference as an opportunity for growth. Often it is not more than simply another way to reaching the same goal. “I came here for the yoga, but now I also love Pilates.” was one of the most rewarding comments I got from a participant.